looking for Carbon Monoxide Detectors? Smoke and CO detectors should be tested every month, Most detectors you can press the test button (Some may need to be held for a few seconds) on the unit. If your detector has replaceable batteries make sure to replace them at least once per year, we typically recommend replacing them twice a year, and historically during time change. Unfortunately with the new modified day light savings there is only 4 1/2 months. Alternatively, using the first day of fall and first day of spring as your reminder will make sure you have a even 6 months between battery changes. Make sure your smoke detectors are using the correct technology. 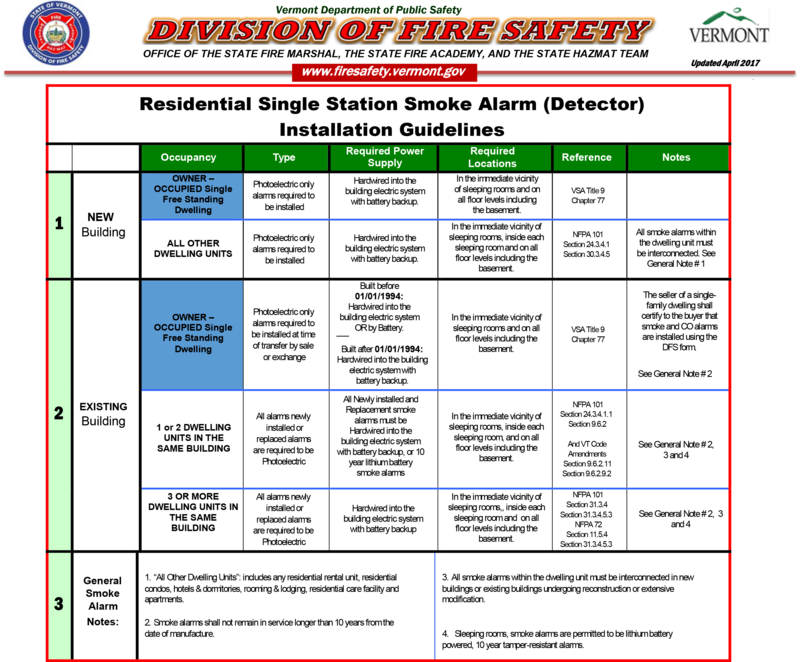 The Vermont Division of Fire Safety requires all smoke detectors to use photoelectric sensors to detect smoke, and to be hardwired in all places of residence except homes built before 1994. Why do you need photo-electric type alarms? Vermont requires at a minimum of one smoke detector per floor level (including the basement) as well as a smoke detector in the immediate vicinity of and sleeping rooms. The smoke detector near sleeping rooms can count for the smoke detector required per floor, but if sleeping rooms are not adjacent, multiple detectors may be required on the same floor. Smoke detectors will emit a non-emergency chirp every couple of minutes primarily for two reasons. The first is for a low battery, if you have replaced the battery and it is still chirping it may be because your detector is expired, Smoke detectors should be replaced every 10 years and some models will alert that their time is up. There should be a manufactured date or expiration date on the back of the detector to let you know when you need to replace it. Carbon Monoxide (CO) is an odorless, colorless gas that displaces Oxygen in our bodies. Some symptoms you may experience are Headaches, Weakness, Shortness of Breath, Dizziness, Nausea or Vomiting, Confusion, Blurred Vision, even Loss of Consciousness and death. If you experience any of these symptoms and suspect CO may be the cause, evacuate the space immediately, then call 911. A common behavior we see on the Fire Department is people will try ventilate their homes, opening all the windows to try and flush the house out. This is putting yourself at a much greater risk staying inside the space, and will make identifying the source much more difficult. Many CO calls we respond to where the windows have been opened have the CO levels have dropped to an undetectable level. If the CO leak is small, even after we have closed your windows and doors, the levels may not build back to a detectable level until after we have left the property. CO Detectors are required outside each sleeping area (same as smoke detectors), as well as INSIDE any sleeping rooms with fuel-burning appliances (like a wood-stove, fireplace, or propane stove, etc.). 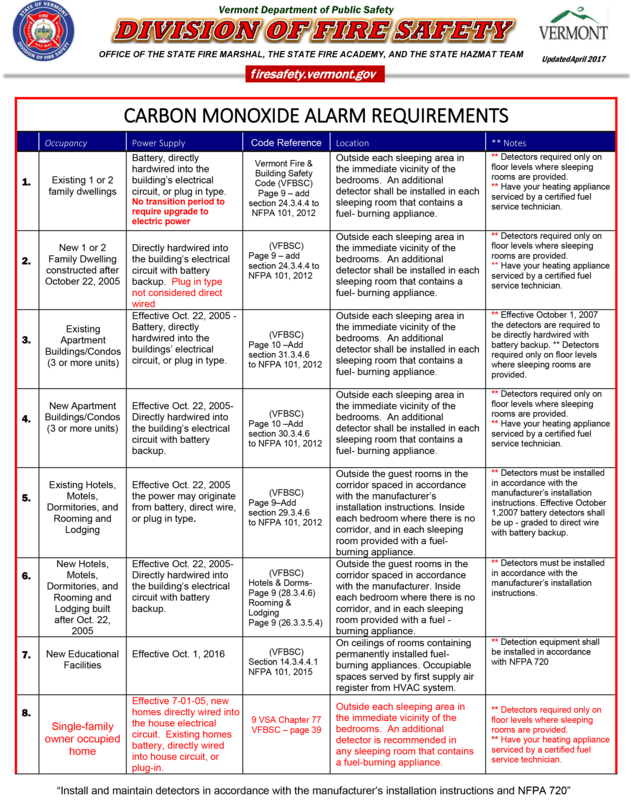 CO detectors are required to be hardwired in homes built after October 2005. Because CO detectors and smoke detectors are required in many of the same location as smoke detectors, manufacturers make combination Smoke and CO detectors. These combination detectors generally only have one type of smoke detecting technology in them so make sure its photoelectric and CO to be compliant with Vermont laws. Some fuel-burning appliances may give off a small amount of CO as part of their startup (for example: a pellet wood stove may give off a little bit until the flue warms up and a positive draft is established). Because of this it is recommended that CO detectors are placed at least 15 feet away from any fuel-burning appliance if possible to avoid false-alarms. In bedrooms with fuel burning appliances this may not be possible, but should be located as far away from the appliance as possible.